I have a quick announcement and an awesome graph for you. As you may know, I run an online Excel Training Program called as Excel School. I have opened registrations for 3rd batch of this program on September 14th. Thank you very much for supporting this program wildly. In a few hours, I will be closing the registrations for Excel School. 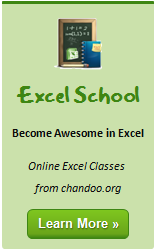 At the time of writing this post (around 10 AM Indian time on 29th), we have 211 students signed up for Excel School 3. This is certainly quite a bit more than what I expected. But, I am also confident and eager to help as many of you as possible. So go ahead and join the program, because, you want to be awesome. When is Excel School 4 coming up? I will not be re-opening excel school this year. I am planning to spend time with students, answer their questions and have fun with my kids. I will be re-opening registrations during Jan 2011. 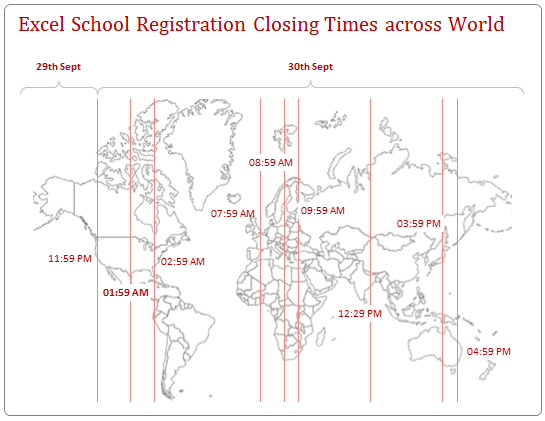 You see the world map with closing times above? Your guess is right. It is made in Excel. First I downloaded an outline map of world (here is one). Then I made a scatter plot with Y as zero and X as horizontal position of the country with some random values. Then I set the world outline map as background for the plot area. Then I added 100% vertical error bars on plus side to show the vertical lines. I have made a template to show time across various places in world. Thank you so much for making Excel School 3 happen. Your support and quest for knowledge motivates me. Thank you. @ Chandoo I was just thinking to myself i wonder how that graph was constructed. Then sure enough there is your explaination! This is the reason i love this blog! @Godzilla... You are welcome. I wouldnt want a sale pitch like this to be less than awesome. I thought, "that is exactly what I have been looking for", but "how2do"? And of course, UNLIKE other XLS consultants, Chandoo actually has a template URL and some screens shots on how to do, wow. This is an example why you have our attention, your messages are opened, and your referring links are clicked through. Well done. First of all i would like to appreciate your hardwork and dedication towards Excel training and making us awesome in Excel. I am a junior accountant working here in UAE and struggling for my future. I know the importance of Excel and that is why willing to make myself awesome in EXCEL. I do not have credit card to pay online for your helping material please let me know if there is any other medium of payment. I appreciate if you can give me some discount as i can not afford much.